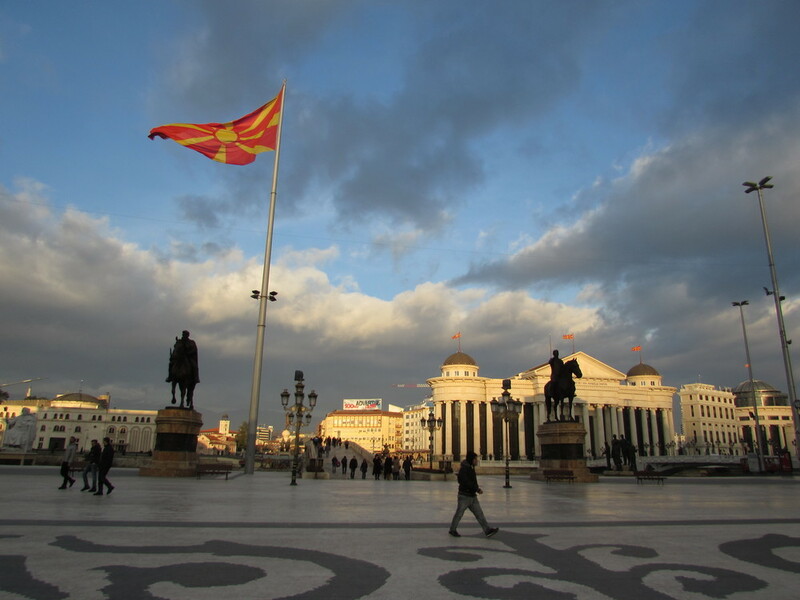 Skopje is the capital of the Republic of Macedonia, a small Balkan state to the north of Greece. Formerly a part of Yugoslavia, it achieved independence in 1991 and almost immediately entered into a naming dispute with its southern neighbour. This naming dispute with Greece led to the Republic of Macedonia being admitted to the United Nations under the provisional name of F.Y.R.O.M – Former Yugoslav Republic of Macedonia. (Don't be surprised if you haven't heard about this, as few people outside of the Balkans region have). However, an important note for travelling in the region, is to never use the word F.Y.R.O.M. in the Republic of Macedonia, and to never call it the Republic of Macedonia in Greece. You can't say I didn't warn you! Why do I mention this? 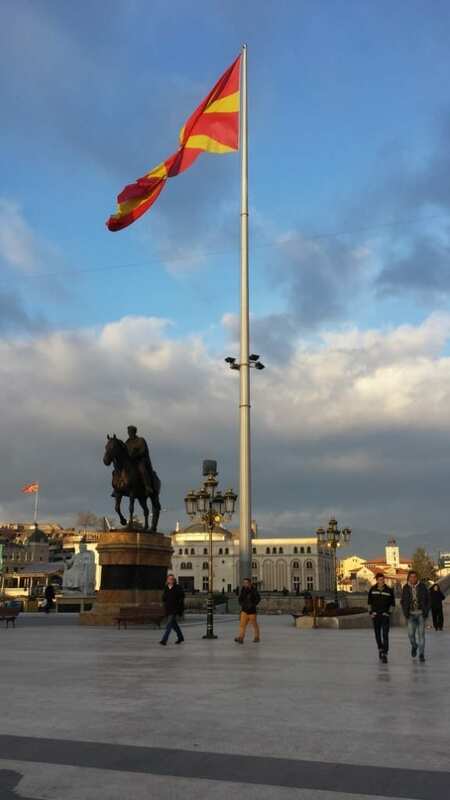 Well, the Republic of Macedonia is a very young country, and one trying to find its identity since independence. This culminated in a political decision being reached in 2010, when the Skopje 2014 project was announced. 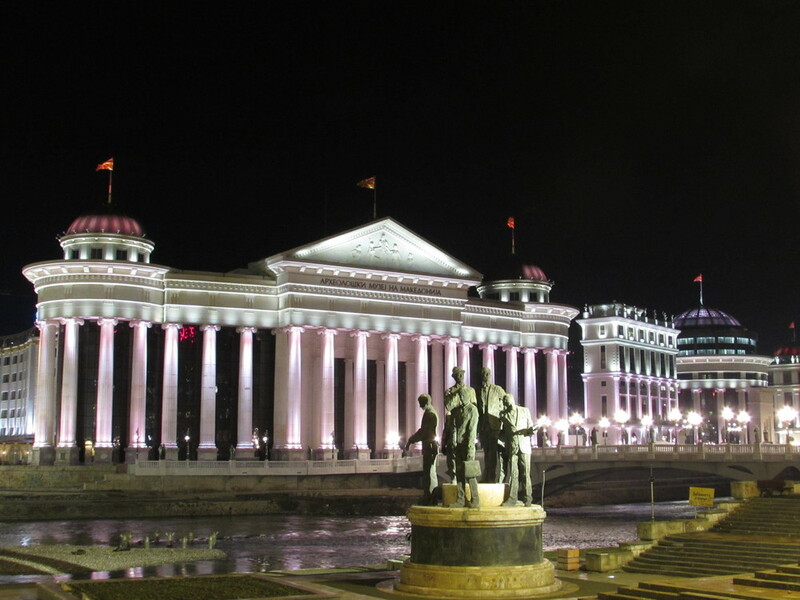 The purpose of this project, was to give Skopje a more classical appeal. The construction of a number of museums, government buildings, and monuments were planned, with the aim that they should be completed by 2014. I visited Skopje in January 2016 as part of a 2 week trip around the Balkans, and it hadn't finished yet. Or maybe the project had been expanded. Who really knows? 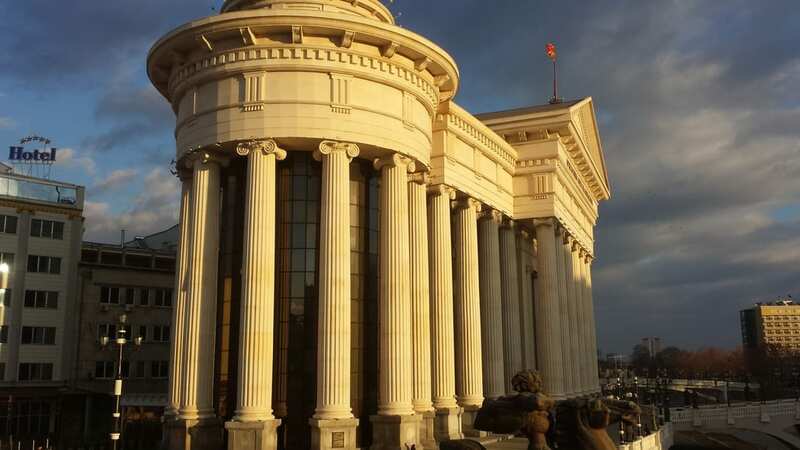 So Skopje is undergoing a neo-classical makeover. This isn't necessarily a bad thing, and is something that happened in Athens almost two hundred years earlier. (In fact, as unpopular an opinion as it may be in Greece, there are many similarities between the situations of the Republic of Macedonia today, and the fledgling Greek state of 200 years ago). The thing is though, there is a tasteful way of going about things, and a blatantly kitsch way. Guess which way Skopje chose? OK, so, the neo-classical buildings are a bit over the top. The flags are a ‘bit big'. But it's the statues. The damn statues. They are EVERYWHERE! 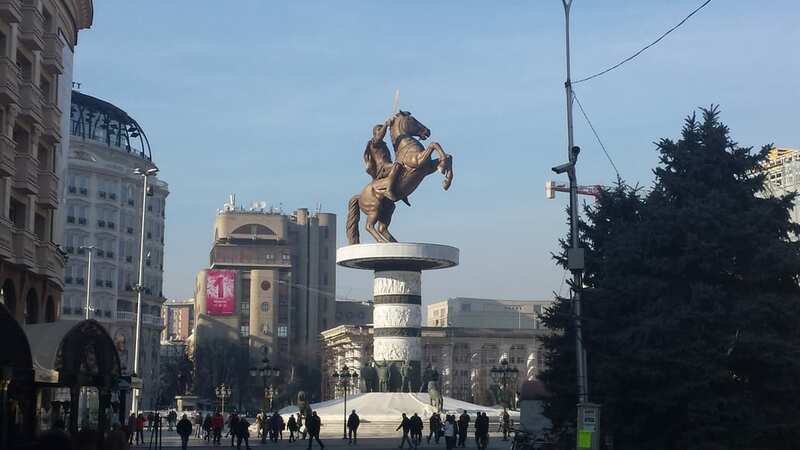 It makes the entire centre of Skopje look like a weird, kitsch Disneyland. It seems to pull in aspects from every major European capital city, and dump them all in one place. To be honest, during the first day there, it was actually quite good fun taking photos of everything. I mean, there is no arguing against Skopje city centre being a photographer's dream. On the second and third day though, I realised just how sad it was. None of it feels real, and while the intention might be to inspire the Macedonian people and give them a sense of pride, no-one I met really felt this way about it. Most considered it to be a waste of money, and just a little bit laughable. Is Skopje the weird, kitsch capital of the Balkans? Oh yes! If I could sum up my experience, it would be a bewildered shake of the head. I'm glad I visited though, and to be honest, no trip to the Balkans would be complete without seeing Skopje. Just keep in mind that very little of it is real and none of it makes sense. After all, why else would a replica of the Arc de Triomphe featuring historical Greek figures be there? If you arrived at this page looking for European city break inspiration, then I've got great news! I have a page just for that here – Alternative city breaks in Europe. Thanks for the honest review. I’d agree to some point. But the fact is that the river Vardar is an actual separator between the two faces of this town- one kitchy and one authentic Macedonian with the smell of the history all over the place. 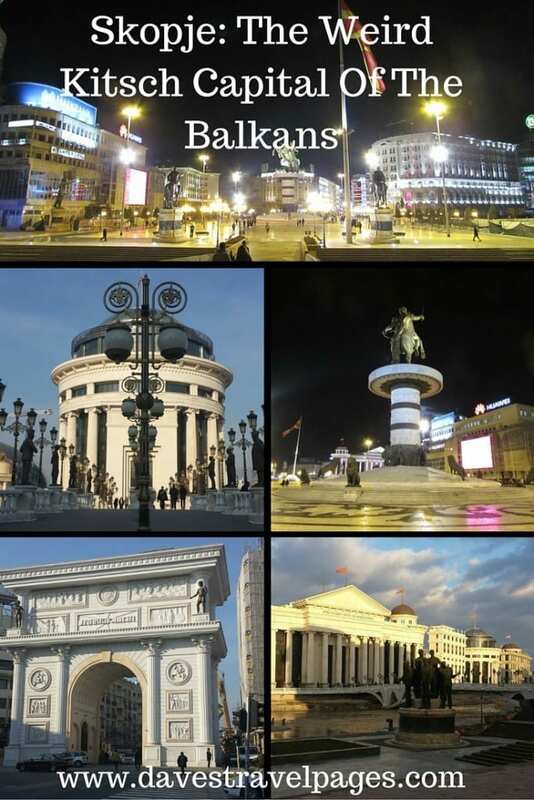 Since I live here(for now) I’d gladly be your guide and introduce you to Skopje’s other side. Do you call Western France Republic of England too Dave? Sorry. There is no place called “Republic of Macedonia:” Please use the neutral UN name of expect hostility. Greeks did warn everyone in good faith not to call them “Macedonians” for just such reasons but unfortunately racist pretentious asshats refused to listen and instead tried to narrate Greeks out of ethnic existence. Now you see the results. It is not harmless calling them “Macedonia”. Very real wars fought over this issues and very plausibly more are coming. Frankly most of those that call former Yugoslavians “Macedonians” couldn’t tell the difference between something authentically Macedonian and a tomato. The mob of patronizing bigots that now unethically downplay the former Yugoslavians recent identity quick change in founders of the Hellenistic period and accompanying state sponsored irredentism against Greece… have no moral or intellectual credibility. Were it up to me I would remove recognition of nations that officially reference the current SLAVIC inhabitants of ancient Paeonia as “Macedonia”. Their unethical evasions effectively amount to collusion in a subtle attempt to erase Greeks. Only if Skopje’s foreign apologists feel the pain of Greeks will they understand the immense evil in which they participate. Thank very much for leaving a comment. Wow, interesting post and insight here. I am curious to visit FYROM for many reasons. Like a political Las Vegas indeed, it seems! OMG, it’s like a political version of Las Vegas! Skopje has exactly that sort of feel to it!